When it comes to Ubisoft, I have a sort of admiration for a key franchise of theirs: Assassin’s Creed. After seeing the game evolve from a simple adventure game to dabbling around with multiple new game mechanics and settings, last year’s Assassin’s Creed Origin marked one hell of a change for the series. Ditching the focus on stealth for a broader and modern RPG appeal, Assassin’s Creed Origin set the standard for the franchise in the future, and this year’s Assassin’s Creed Odyssey does not intend to revolutionize the formula, but rather evolve it with a focus on the notion of storyline choices and role-playing mechanics. Before we start this review, here’s a very important note to make, which might or not push away fans of the series. Assassin’s Creed Odyssey is like Origins a prequel to the history of the creed itself. While it was thought that last year’s game told the origins of the Creed, Assassin’s Creed Odyssey is set 400 years before that, right in the heart of the Peloponnesian war which saw the Athen-led Delian League fight against the Spartan-led Peloponnesian League. For those that played Assassin’s Creed Origins and the rest of the franchise, this might make the whole timeline a bit confusing, considering Bayek (from Assassins’ Creed Origins) was the creator of the Assassin’s Creed with the Hidden Ones, which later on was shaped into the more modern version of it thanks to Altair in the first Assassin’s Creed released 11 years ago. So how can a story set 400 years before Assassin’s Creed Origins actually tell another… Well, an origin story? Well, without revealing too much of the story, I can tell you Assassin’s Creed fans that all pieces will fall in together into one perfect “Aha moment”. Assassin’s Creed Odyssey offers you for the first time the opportunity to choose to play as either a man, Alexios, or a woman, Kassandra, throughout the entire adventure. While this is not technically a first as Assassins Creed Syndicate also had both a male and female protagonist in Evie and Jacob, the difference here is that Alexios and Kassandra’s stories will play differently, and while there’s a common narrative, there’s a lot of story branches that depend largely on your pick of the character and eventually decisions you make in the game. Like with Assassin’s Creed Origins, the same modern time character – Layla Hassan – is at the base of the storyline, who wants to learn more about the origin of the Assassins and henceforth their relations to the Isu or the First Civilization, a humanoid species that is believed to be the creators of humanity and the Pieces of Eden. This will then take us to Ancient Greece, where we learn that Alexios and Kassandra are direct descendants of Leonidas (that same one from the movie 300), who became outcast and mercenaries after a tragic event in their early youth. No matter what your choice of character is, you will wield a weapon inherited from the first civilization on top of rest of your Greek mercenary gear and armour. While Assassin’s Creed Origins was mostly around a mass of land in the Egyptian Nile Delta, Assassin’s Creed Odyssey is quite an interesting game map since it’s set in Greece, split into regions stretching from northeastern of Attica to the far reaches of the Aegean Sea, each under the control of a Spartan or Athenian leader. The leaders unlock contracts you can accept since you’re a mercenary, knowing that other will scour the land and have a contract on your head which goes higher based on your decisions in the game. For example, if you assassinate too many guards of another faction or loot in plain sight will turn you into an outlaw, making your missions harder with more higher level enemies, unless you decide to clear the bounty by paying some drachma (Greek currencies). These same bounty hunters as well can be quite challenging to defeat, and the longer your bounty, the higher the loot level is when defeating these mercenaries. In short, a definite upgrade to the Phylakitai mechanics in Assassin’s Creed Origins. But the greatest change that a travel back in time to Ancient Greece did is the region’s typography, and its effect on the gameplay mechanics, now bringing a key feature from the Assassin’s Creed IV: Black Flag days: the naval combat. Although present in a basic way in Assassin’s Creed Origins, naval combat in Assassin’s Creed Odyssey is a more complex update from the Black Flag and Rogue chapters. While it brings many known elements like customization on numerous parts of your ship such as stern, sails, and more, as well as combat mechanics like ranged volleys, boarding and ramming, there’s added RPG elements to that part of the game as well. The most drastic change is building your ship’s crew (the Adestria), where you can recruit and assign up to four lieutenants that will enable different combat bonuses and will also help you during the ship boarding. Lieutenants, like it is the case with gear, have a different level of rarities, and while some are easy to obtain by just simply knocking them out during mission then offer them to join your ranks, others have dedicated missions to finish and usually are the rarest. On top of all, this change brings back as well the shift to naval exploration, with a bigger option to find loot in an underwater shipwreck, but also discovering uncharted islands full of mystery, like it was the case with Black Flag. As mentioned before, the series is moving its focus towards traditional RPG, and this time Assassin’s Creed Odyssey bring systemic choices that can alter narration on the sidelines of scripted quests. Your decisions in conversation will affect missions, very much it did in previous games that tackled on that idea such as the Mass Effect series, even on the front of romance with NPCs. But most decisions are devoid of any sort of right and wrong, but dialogue choices will change Alexios or Kassandra’s character into a more brutal or compassionate one, as well as the way NPCs speak to you on the long run. But the RPG part is most noticeable in the upgrade to the equipment system, where statistics are more important than ever before when defining the play style of your character. It is not only possible to modify the numerous armour pieces ranging from legs to helmet, but also to add various additional bonuses, known as engraving, which can, for example, add a certain amount of extra damage with melee attacks, boost stealth or buff long-range attacks. What finally makes your experience unique is in the way your skills sets are applied, whether you want to focus on stealth, melee combat or long-range fighter. Because the skill tree is different in comparison to Assassin’s Creed Odyssey, with no branches intertwined between each of the three trees (Hunter, Warrior, Assassin), your ability points will mould either Alexios or Kassandra into the deadly mercenary you want it to be. Your character’s level up also affects your stats, and now it’s much more useful to shop at merchants to upgrade your gear – either by crafting or direct purchase – than it was the case with Assassin’s Creed Origins, where the progression was more toward finding loot. Finally, the game on top of baseline abilities that are known like whistling or using eagle eye with Ikaros, there’s also Ranged and Melee abilities you’ll unlock and can assign to shortcut keys including Spread Shots, Venomous Attack or the Bull Rush, expanding your arsenal. Graphically speaking, Assassin’s Creed Odyssey is a step above its predecessor. Even if the engine is the same, Origins’ land offered huge expanses of sand, and on the opposite Odyssey has environments that are far more varied and colourful. Whether on land or at sea, the game is a treat for the eye, with a dynamic weather system, day and night cycle, and will look even more gorgeous if you own an Xbox One X making use of the HDR (and I assume the same experience on the PlayStation 4 Pro). Although I did notice a great upgrade on the front of animations, whether movements in general or collisions (especially at sea with naval combat), there are still some small hiccups. Facial expressions show immense depth on skin features, emotions and not just on humans but animals as well, but some conversation show some weird lip sync issues and stutter with the body movement. Nevertheless, the game is amazing to look at, and you’ll probably waste so much time in the photo mode which makes a comeback from the previous episode, especially if you’re using the game’s new exploration mode which removes all screen “clutter” like HUD elements. 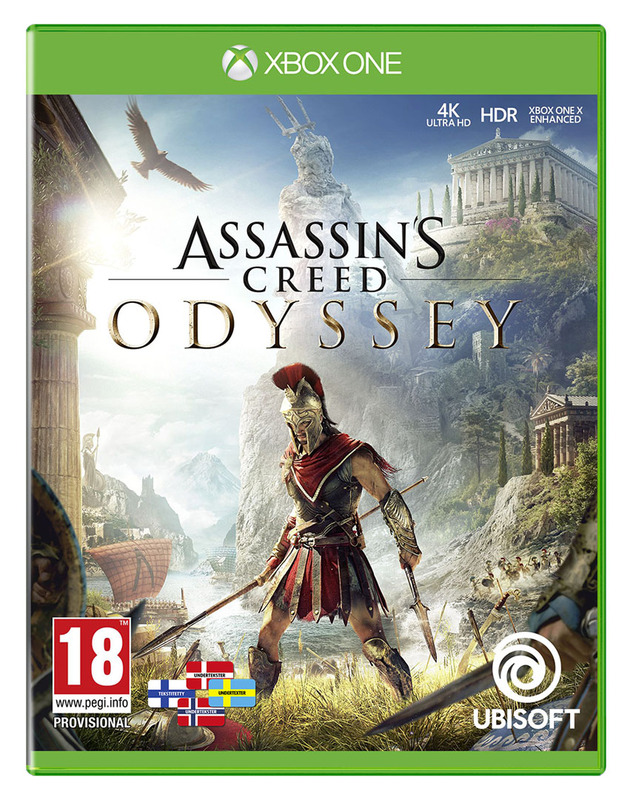 Ubisoft has certainly decided to give the PC gamers a proper edition of Assassin’s Creed: Odyssey, and as such that platform version is not, in fact, a port. That’s the most important thing to note in this segment, as it should give you an idea of how well the game runs on PC. If you checked out the minimum requirements you’ll know the game is actually designed to run on a variety of hardware, and higher settings won’t need something extravagant. As always, make sure your drivers are updated and you have the latest patches before diving in. Speaking of diving in, let’s take a look at that performance! Since we prioritize smooth framerate a ton, we started off on Ultra but brought it down to High, and we’re happy to say that Assassin’s Creed: Odyssey stayed at a steady 60 at that preset for most of the time we spent with it. We saw some hitches and drops every so often, but it was a consistent framerate for the most part. We didn’t try for 4K because why would we, so it’s important to note that my experience is reflective of the 1080/Full HD. As for visuals, the game is just brilliant, and we were able to enjoy the whole shebang on our test PC without turning down any settings. If you really want it to shine visually and you don’t have a top-shelf card, you’re gonna have to settle for something closer to 30. Assassin’s Creed Origins was reviewed using an Xbox One and PC downloadable copy of the game provided by Ubisoft. The review was tested on an Xbox One X and a PC running Windows 10, with an 8GB NVIDIA Geforce GTX 1070 fitted on a 4th Generation Intel i7 4790 3.6Ghz CPU and topped with 16GB of RAM. The game is also available on PlayStation 4 in both retail and online store releases. We don’t discuss review scores with publishers or developers prior to the review being published (click here for more information about our review policy).